There has been a lot of uproar from conservatives over a proposed Muslim community center in Manhattan to be built two blocks away from Ground Zero. Many conservatives have found the proposal of this mosque to be insensitive to those who died in the September 11th attacks nine years ago, but in my opinion, I do not see anything wrong with the building. 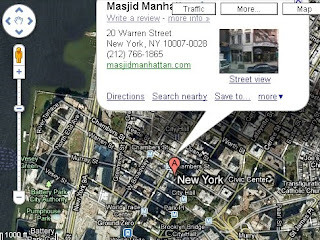 Imam Feisal Abdul Rauf spoke out about his building in the New York Daily News, stating that the mosque was not intended to be a divisive structure. The project has been mischaracterized, so I want to explain clearly what it would be. Our planned 13-story community center is intended for Park Place between Church St. and West Broadway. It is not a mosque, although it will include a space for Muslim prayer services. It will have a swimming pool, basketball court, meeting rooms, a 500-seat auditorium, banquet facilities and many other things a community needs to be healthy. The center will offer theatrical programming, art exhibitions and cooking classes. These are amenities missing now from this part of the city. And, yes, the center will have a public memorial to the victims of 9/11 as well as a meditation room where all will be welcome for quiet reflection. The center will support soul and body. The center will be open to all regardless of religion. Like a YMCA, the 92nd St. Y or the Jewish Community Center uptown, it will admit everyone. It will be a center for all New Yorkers. What grieves me most is the false reporting that leads some families of 9/11 victims to think this project somehow is designed by Muslims to gloat over the attack. Critics can't seem to differentiate between those who perpetrated the acts of terrorism against this nation and the faith that those people shared with many Americans, including some that were killed nine years ago. Muslims have worked hard, fought, and died for this country, and to attack their faith on the actions of a few is wrong. Where is the protection afforded to the minority of the population? Wasn't this country founded on majority rule with respect for the minority?